Who are Ferguson and Friends? In addition to David and Laura Ferguson, group regularly includes "friends" who are excellent musicians. The group is usually a 5-piece group with a rhythm section (piano, bass, drums) along with David (trumpet) and Laura (voice). David and Laura Ferguson are music professors at Indiana University of Pennsylvania, and have been performing together for more than 15 years. On trumpet, David has performed all over the country with orchestras, concert bands, jazz bands, and combos. He has played with Olivia Newton-John, LeAnn Rhimes, Louie Bellson, and the Gatlin Brothers. He has performed his original compositions in Germany and has also performed in Russia with the Hoodlebug Brass Quintet. Laura is a Downbeat Magazine award-winning singer who is a national leader in elementary jazz education. Laura also rocked as a performer at Willie May's "Rock Camp for Girls" in 2008. 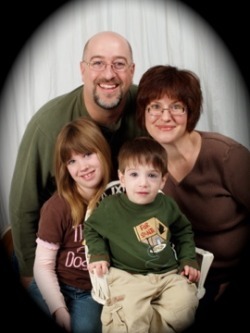 The couple live in Indiana, PA with their 2 children, Ella and Xavier. Check out what we can do on our "Music Examples" page. Make sure you contact us for your event.